*Crush the digestive biscuits to your preference and slowy add in the melted butter. *Again the butter is to your preference. *Line the tin with cling film as this helps get the cheesecake out easy when it is set. *Cover the base of the tin with the crushed biscuit mix. *Mix together the Philadelphia Soft Cheese Cadbury Chocolate and the icing sugar. *Whip the whipping cream and then add it to the mixture. 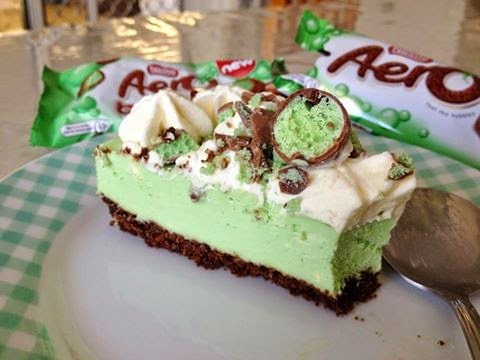 *Grate the 2 Aero bars. *Add about 3/4 of it to the mixture and mix together. *Spread the mixture on top of the biscuit base. *Add the rest of the grated aero to the top of the cheesecake. *Now leave to set over night in the fridge.